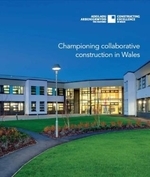 CEW published its latest annual report last week and the figures look good – Welsh construction is performing well and more industry is engaged with best practice than ever before. Welsh construction is now one of the best performing economic sectors in the UK. CEW can’t claim any credit to the actual output but we can argue strongly that as a result of our work, the industry is engaging with best practice and reaping the benefits in terms of output, growth and value. Last week we held our AGM and published our annual report. In the figures outlined at the meeting and on every page of the report itself, it is clear that best practice, as championed by CEW and our stakeholders, is building a better Welsh environment. Adherence to principles such as collaborative procurement and team working is helping Welsh construction to save money and maximise value. Every £1 we spend in construction doubles in value, providing enormous benefits for local communities and the country as a whole – so long as we continue to deliver projects in the right way. The evidence is contained in our successful Exemplar programme and showcased each year in our CEW Awards. The projects entered for the 2015 awards are worth over £400 million to Wales but the value in terms of benefits to communities and the environment go much further. From the shortlisted schemes alone, CEW estimates that almost 800 jobs or placements were created, 30 charities supported, five car parks created, 150 sessions delivered at local schools and colleges and 130 International Baccalaureate qualifications facilitated. Educating, informing, influencing and cajoling everyone in the Welsh built environment supply chain to embrace the principles of Constructing Excellence never ends. It is why in 2016 CEW will continue to challenge procurement processes, highlight how low carbon homes can be built cheaply and effectively and demonstrate that waste management has to be an integral element of planning and site management. As construction in Wales continues to grow and thrive, our best practice message needs to be louder and more coherent than ever before.